Buccaneer is the most luxurious touring caravan range in the UK. This most opulent of caravans features class-leading design and many more features as standard than any other brand. Innovative design and development takes the Buccaneer to a whole new level - now 8ft wide, with a unique integrated self-levelling system and a complete new redesign, both inside and out. 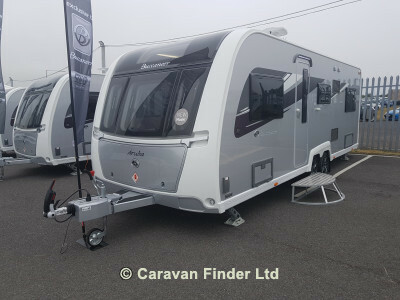 Whilst the flagship Buccaneer is built on 50 years of expert craftsmanship, it is a thoroughly modern caravan with unique and cutting-edge technology. The multi-award-winning Buccaneer goes from strength-to-strength - this is the epitome of the great British grand tourer! Our most popular family layout is now available in the Buccaneer range! The all-new Buccaneer Aruba boasts all of the range's opulent specification, creating a 6-berth family caravan par excellence! This clever layout has a large lounge, converting to a supersize double up-front, a wraparound dinette amidships - creating a further double - plus a fixed French-style double bed at rear.